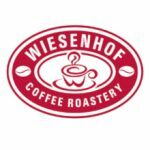 Locally operated throughout South Africa, we treat our customers like our neighbors. When you call, you will not be connected to a call center across the country. Your call will be answered by an agent in our office near you. 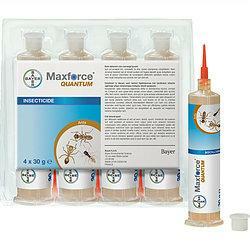 Our pest control materials and methods are at the top of the industry. We also ensure that they are safe and environmentally friendly for our valued customers and their families. We work hard to provide a level of service that will ensure customer satisfaction. Ecopoise understands that it takes happily involved customers and their word of mouth for our business to grow continuously. We believe that a high-quality level of service starts with a company’s employees. We hire only dependable exterminators that you will be able to count on when it comes to providing you with the best service possible. We run background checks and drug tests on every one of our employees. Not only do we strive for our customers to feel satisfied and secure, but our employees as well. 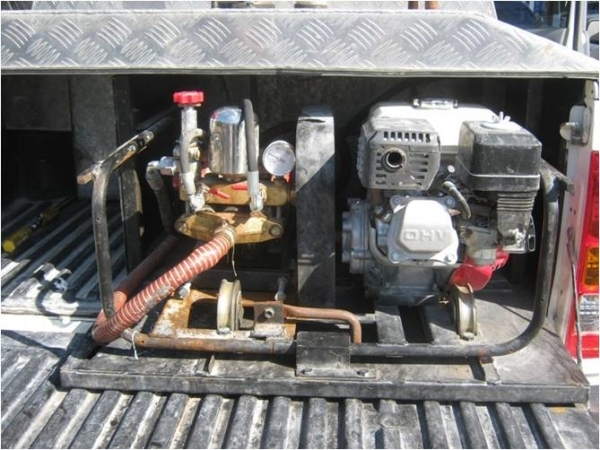 By providing a stable working environment, and constantly training and educating our employees about the ever-changing South African pest control industry, we know that our customers will be treated with the highest level of service, while being educated at the same time. Our mission is to protect your business, home, family and/or employees from pests, safely and efficiently. Have a look at some of our products! Pests are never welcome in your home. They can be a serious health risk to your family and they can cause major damage to your home, internally and externally. Regular maintenance for your home against South Africa’s most common pests gives you and your family peace of mind. Our services begin with an evaluation by a highly qualified inspector, who will gladly provide you a strategy to remedy your pest problems. Ecopoise offers a variety of service options, including, monthly, quarterly, one-time services. Our general pest control program covers ants, roaches, centipedes, earwigs, silverfish, spiders, mice and many other common pests. Our technicians are dedicated to their assigned territories and are in your neighborhood on a regular basis. Following your initial inspection, our technicians will continue to monitor your home and perform routine, preventative maintenance. The two most common species of rodents likely to infest our homes and garden in South Africa are the House Mouse (mus-domesticus) and the Brown Rat (rattus-norvegicus). Both of these can cause serious distress and damage as well as been the carriers of lethal bacteria. We can never ever doubt the agility and perseverance of these rodents. In order to combat these rodents successfully we have to examine the reasons they are in a particular area, the access to this area and availability of food and or water. Ecopoise has fully trained technicians to help you in eradicating and preventing rodent infestation. Most households at some stage will inevitably encounter an insect problem of some sort at some stage. The most common infestation in South Africa is likely to be the common garden ant (lasius niger) or the common wasp (vespula vulgaris). These insects can sometimes become too much of a nuisance for us to share our dwelling with and Total Pest Control have methods of eradicating these insects with little or no disruption to the home. We can also encounter the more serious insect pests such as the Cockroach (blattella germanica), that can literally take over your home or the more nasty biting insects such as Bed Bugs (cimex lectularius) and Fleas (ctenocephalides felis). 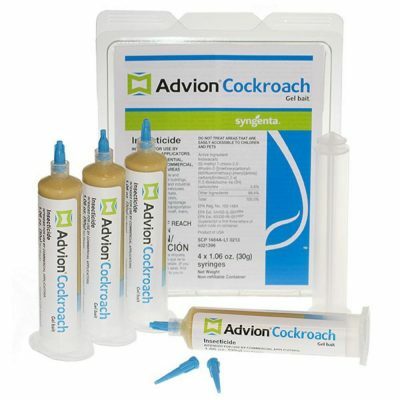 An infestation of these insects requires expert treatment to completely eradicate and Ecopoise has various techniques both physical and chemical to do just that. Crawling Insects,Flying Insects, Ants, Flies. 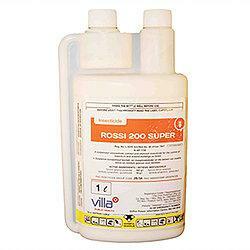 This practice entails applying the right product at the right time to control target weeds. This is often called IPM - integrated pest management. 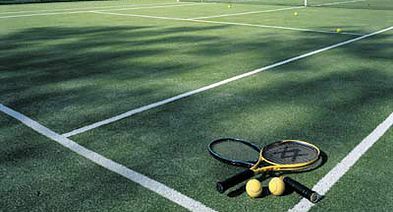 Weed control - combined with regular fertilization, proper mowing and correct watering practices - will keep the grass thriving while the weeds disappear. 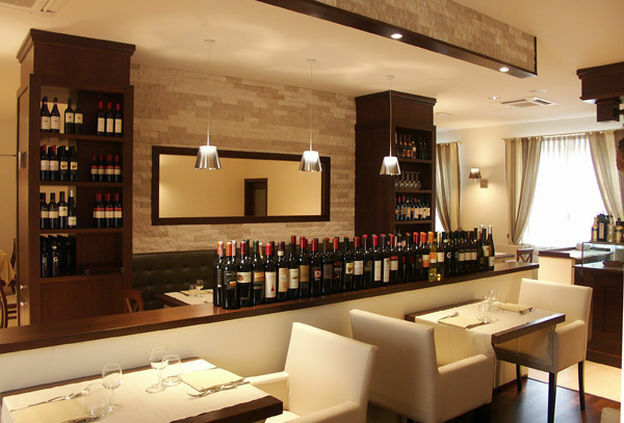 At Ecopoise, our team of experts, understand the different requirements of each area in the hospitality industry. 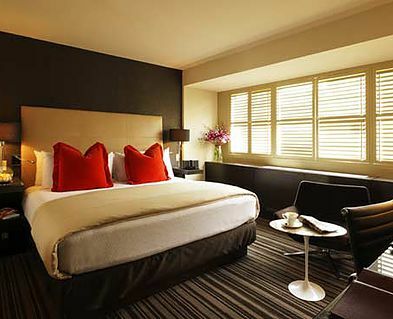 Bed bugs and other biting insects pose the biggest pest threats to hotel accommodation. All hotels are at risk, but especially those with a large number of international travellers or guests that move frequently between hotels. Early detection and innovative solutions, such as Ecopoise's chemical-free heat treatment for insect ensure that bed bugs do not spread to other parts of your building. On top of treatment and prevention, we can help you to train your staff to check for bed bug signs to ensure early detection. 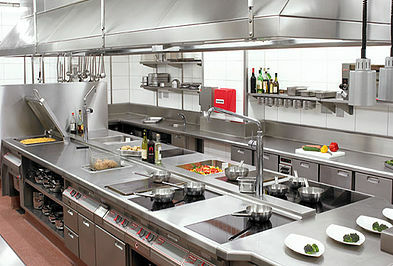 Mice, rats, flies and cockroach problems pose a high risk of spreading disease in the kitchen, restaurant and other dining areas. Proactive treatment is essential in these areas and will be expected by environmental health inspections. We are experts in understanding food safety legislation, which regulates businesses handling and serving food – as set out by the Food Standards Agency, HACCP regulation and monitoring. External: Bird deterrence and proofing against rodents and other wildlife will be included in our service to treat and prevent pest problems in your grounds and gardens. Rapid, discreet response - our rapid response commitment means that your technician will be with you quickly to deal with the pest problem so that it does not come back. Tailored solutions - designed specifically for each hotel area and to prevent any pest activity indoors and outside. 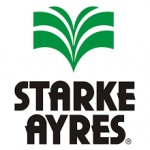 Dedicated scientific team - provide expert knowledge of pests and the most effective control methods. Integrated Pest Management (IPM) - comply with all legislative standards and any audit requirements. 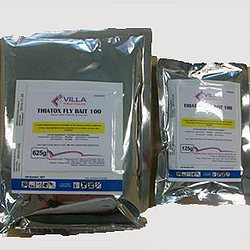 Innovative solutions - including our chemical-free heat treatment for bed bugs. Integrated service plans - our plans are based on specific threats and your particular needs. Your local technician will regularly visit your premises to check bait stations, look for signs of pest activity, identify potential risks and advise on any steps to reduce the risk of future pest problems. Pest awareness training - we provide training for house-keeping staff to help spot the early signs of a pest problem, enabling quicker and more effective treatments. Evidence of pest activity on the premises of your bar or restaurant could seriously jeopardise your reputation. Mice, rats, flies and cockroaches pose a particular threat to hygiene standards in food preparation and storage areas because of their disease risk. By reducing the threat of pests and potential damage and contamination to food and stocks, we can help to protect your brand name. A professional pest control service can help to protect your assets and ensure you continue to deliver high quality food and service. 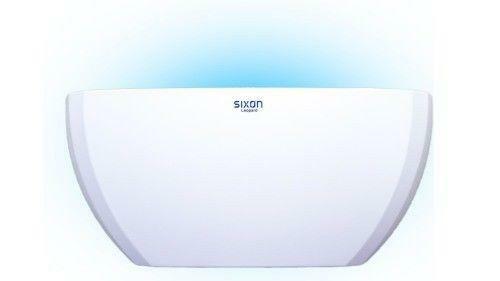 It will also enable you to maintain the highest level of hygiene throughout your premises. Regular visits - your local Technician will regularly visit your premises to check rat bait stations look for signs of pest activity, identify potential risks and advise on any steps you can take to reduce the risk of future pest problems. Tailored solutions - we customise our service to control common pests affecting food businesses, such as rats, mice, flies and cockroaches. Pest-disinfection service - using a unique biocidal product to reduce disease-causing organisms left by pests, the pest disinfection service offers peace of mind. Rapid response - If there is a problem, our rapid response commitment means your Technician will be with you quickly and will deal with any pest problem (using innovative methods such as Entotherm insect heat treatment) so that it does not come back. Food Hygiene Rating Scheme compliance - our solutions aim to fulfil all obligations as required by the Food Hygiene Rating Scheme (previously Scores on the Doors). 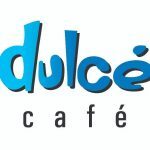 It is a requirement for all food based businesses and looks at the confidence in management, hygiene, safety, and structural elements of a workplace. A supermarket is no place for a pest. 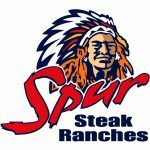 Any sign of pest activity can seriously harm your brand and public perception and, critically, pose serious health risks in areas where fresh food is handled. 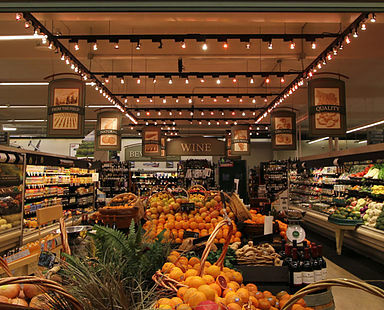 At Ecopoise, our pest control solutions for food retailers provide the reassurance of complete protection from pest problems. At Ecopoise, we understand the importance of good pest control to ensure a safe and hygienic environment for employees, customers and visitors. Our understanding of food legislation will ensure that our service enables you to comply with all legal obligations. Innovative treatments - our research and development team has developed a range of proven solutions, including our chemical-free Entotherm insect heat treatment, to solve any issue with minimal disruption. Bakeries - may face particular problems from Stored Products Insects (SPIs) and our innovative chemical-free heat treatmentoffers the ideal solution to these insect pests. Even if your business does not handle food, pest problems can occur on premises where goods and people are constantly on the move. Once they are present, pests could damage your stock and severely harm your reputation. As non-food retailers, you may face pest threats from rodents, flies, moths and biting insects. A wide range of other insects and nuisance birds are also common problems. A professional pest control solution can provide the protection you need for your stock and reputation. It will also ensure a safe and hygienic working environment for your staff. Whatever the nature of your business may be, from second hand furniture to textiles, our technicians will work discreetly to protect your business from any pest threats. Local certified technicians - our technicians are local and they are there to support you whether it is a one-off pest problem or to provide you with the peace of mind of a service plan. Regular service visits - your local technician will regularly visit your site to check and top up bait stations, check for signs of pest activity, identify potential risks and advise you on any steps you can take to reduce the risk of pest problems. Innovative treatments - we have access to a range of targeted treatments, including chemical-free solutions to eliminate bed bugs and moths. Preventative measures - we can offer expert advice on proofing and preventing a re-infestation. 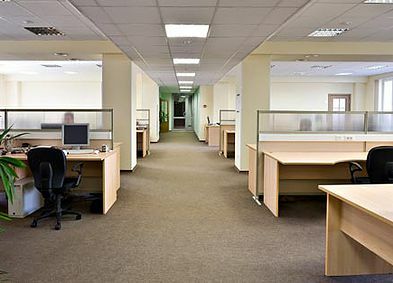 At Ecopoise, we can help to maintain a safe environment for office staff and visitors, and minimise the spread of disease and germs from common pests. Rapid response - If there is a problem, our rapid response commitment means that your technician will be with you quickly to deal with the pest problem so that it does return. Multi-site contracts - If you are responsible for a network of premises, these can all be incorporated into a single service agreement with an account manager to coordinate service delivery across your offices. Each individual site will still have its links to local technicians and surveyors. Pest control has an important role in preventing secondary infection in hospitals, surgeries and nursing homes. As the leading expert in pest control, Ecopoise has the expertise to deliver the highest level of reassurance against pests, while being sensitive to the special needs of working in a healthcare environment. By their nature, healthcare facilities are busy places and it is difficult to prevent rodents, flies, cockroaches and other insects such asants from entering the building and thriving with the food and warmth they can find there. We have a solid understanding of the requirements for healthcare facilities. Prevention advice - if a pest infestation is discovered, we will help to prevent the spread of pathogens. Pre-Construction or Soil Treatment involves building an anti-termite barrier underneath the building structure as a protection against damages caused by Subterranean Termites; this treatment is done before the building is constructed. With the use of hydraulic spray nozzles, the sites are treated a water-based termiticide before the laying of the concrete slabs on the ground. The non-repellent termiticide kills the subterranean termites by contact and ingestion. Termites that come into contact with the termiticide experience the “slow kill” and in their return to the colony, and they transfer it to the rest. Treatment has limited effectiveness if carried out when the soil is saturated or excessively wet, or when it is likely to rain. Our technicians are experienced and well-equipped to carry out soil treatments for your premises safely and systematically to ensure high effectiveness. Nonetheless, to give our customers greater assurance, we warrant the effectiveness of our treatment for five (5) years and undertake the responsibility to carry out re-treatment should there be a re-infestation of Subterranean Termites within the warranty period. Pest control companies are not necessarily experts in exterminating pests in your home and business. However, experience and training can make a big difference when choosing which pest control company to call. ECOPOISE has been taking care of pest problems for 10 years. Our technicians undergo rigorous training on pest biology and management to ensure that we only provide you with responsible treatments. 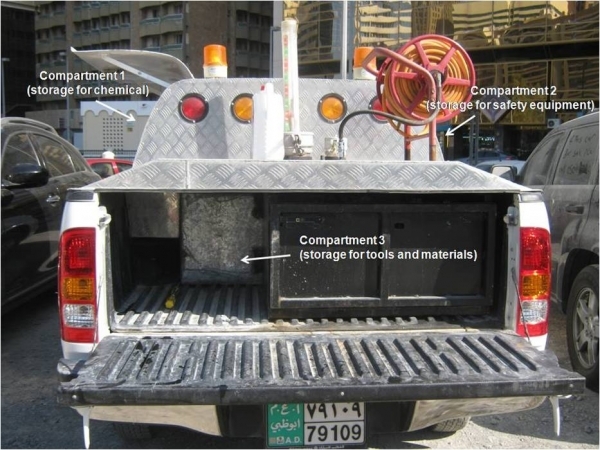 For the infestation of cockroaches, bed bugs, and other crawling insects comprehensive spraying will be carried out in the premises using Approved chemicals by Ministry of Environment and Water of Dubai and Abu Dhabi Municipality. As for hard to reach and critical areas gel baiting shall be done. 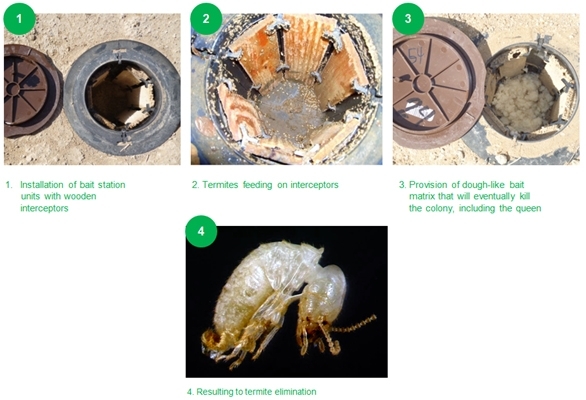 Flying insects can be controlled in numerous ways like misting, fogging and larviciding, however the ultimate solution for pest infestation would be eliminating the root cause of the infestation thru sanitation and exclusion methods. We do Internal and External rat bait system using approved rodenticides. They will be placed only on selected areas particularly on possible runways and breeding site of rat and mice.We also offer pest control for other pest, like snakes, birds, and cats control. We offer alternative eclusion methods like trapping and exclusion methods like nets, as we from Teminex Pest Control do care for our environment. Weed problem has also been a problem for most roadworks, and building construction. Ecopoise has developed an spraying system for weed control using the latest herbicide in the market. With its weed sprayer system , surely your weed problem is under control. For Stored product pests, Ecopoise is fully capable of Fumigation. Be it Stack , Container or Bulk fumigation, we can make the solution specially catered to your specific needs. 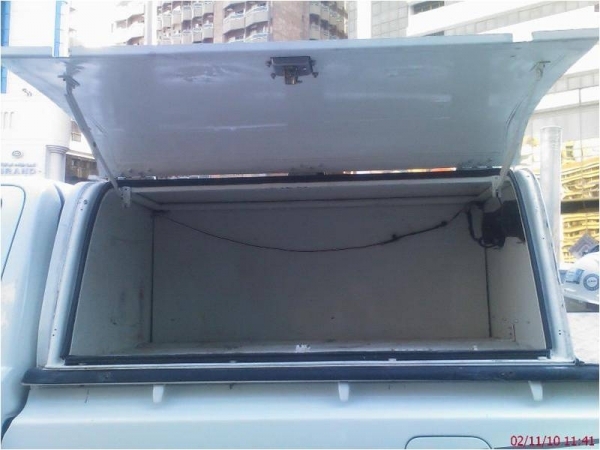 Fumigation is a risky process and we at Ecopoise will carry the safest fumigation program possible for you. Our Integrated Pest Management Program (Partnership,Exclusion,Sanitation,Treatment) has been the foundation for our success in achieving and maintaining our status as a trusted provider of pest control services in ABU DHABI and DUBAI. Once you sign an agreement with us, that is the start of our partnership. Because we want the least usage of chemicals as much as possible, we also incorporate other control methods that does not involve chemicals. We also use mechanical traps and pheromone traps as well. We want to solve the pest problems into their root cause thru exclusion and sanitation. PARTNERSHIP - achieved by close cooperation between us and our client partner thru effective communication. We are very open to the needs of our clients. We have emergency response team for your urgent needs, all you need to do is call our Customer Service Hotline and a reliable team shall assists you with your needs. EXCLUSION - aims to protect a building against pest entry through effective proofing measure and inspections by us followed by recommendation which our client partner shall work upon. We serve as your another opinion by giving you recommendations on what has to be improved from your facility to prevent pest infestation. This is thru our service inspection, done by our qualified Entomologists. SANITATION - calls for high standard of hygiene. A professional pest control specialist can assist you in the maintenance of proper sanitation and pest control standards thru our inspections reports. In addition, we also help your staff by giving you pest awareness training. We at Ecopoise educate our clients so they can be a reliable partner towards our common goal, to control the pest in their facility. TREATMENT - our last approach in managing pest problems whereby treatment of infestation must be efficiently and speedily carried out with consideration for safety measures. As you can see, treatment is just a part of our Integrated Pest Management Program. We do not rely majorly on chemicals, but we believe in solving pest infestations at their root cause.est Control now and you will receive a free survey. Our qualified entomologist and sales consultant shall inspect your premise Green Pest Management is an extension of our Integrated Pest Mangement Program. The basics of Integrated Pest Mangement is being followed only for one exception, the chemicals being used for the treatment part are ORGANIC PESTICIDES. Organic Pesticides are naturally occurring and are low risk materials. 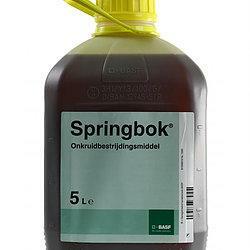 Using these organic pesticides lowers the risk of health and safety issues. In lieu of some organic pesticides, Synthetic insect growth regulators are also being used. 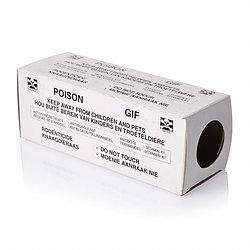 These IGRs are pest specific and have a very low mammalian toxicity. They may not be organic pesticides but they given that they qualities of being target specific and have very low mammalian toxicity they are found appropriate for low impact structural pest management as they are incorporated with a definitive Pest Management. Aside from the use of organic pesticides, Green Pest Management shall also rely heavily on the usage of monitoring thru physical control and trapping. This method allows us to apply the usage of pest action threshold. The pest action threshold shall be set so as during monitoring if pest action threshold is reach, appropriate actions will be implemented. 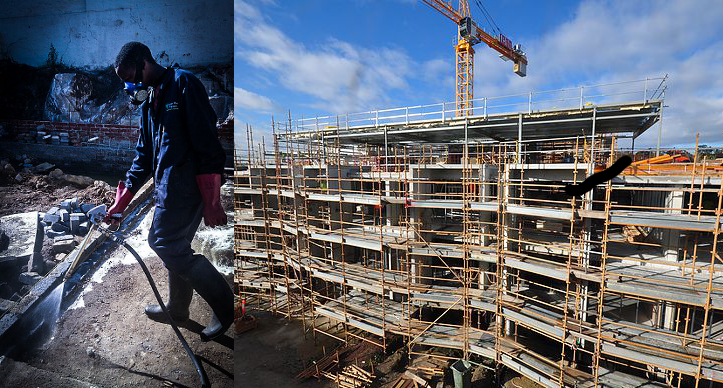 The first week on each new site is the most dangerous and accidents are more frequent at the end of the day. To minimize accidents at the work site, most construction companies conduct health and safety induction training to all employees and personnel entering the work sites. 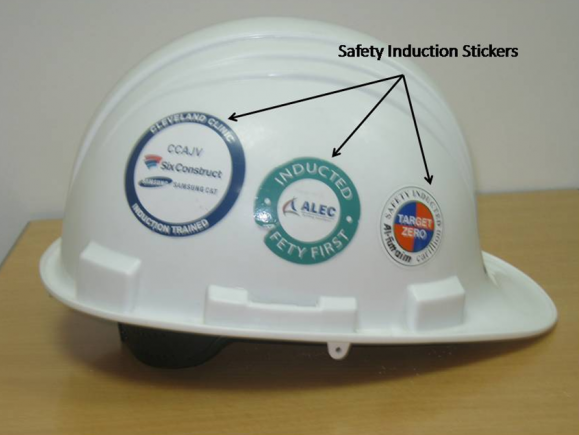 A sticker placed on hard hats bearing the name or logo of the contractor is a symbol that an employee has completed the health and safety induction training. The hair and skin on the neck and head must always be protected. This is important in situations where exposure from chemical sprays is possible. Chemical-resistant rain hats, wide brimmed hats and washable hard hats are good. Do not use cotton or felt hats as they absorb pesticides. Wear shielded safety glasses or a full-face shield whenever the chemical could possibly contact your eyes. 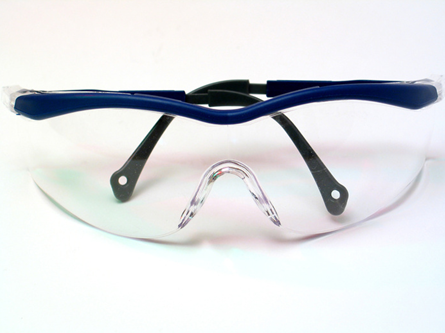 Safety glasses with brow and side shields are acceptable for low exposure situations. Always wear goggles or full-face respirator when you are pouring or mixing concentrates or working in a highly toxic spray or dust. In high exposure situations when both face and eye protection are needed, a face shield can be worn over goggles. Clean them after each use. 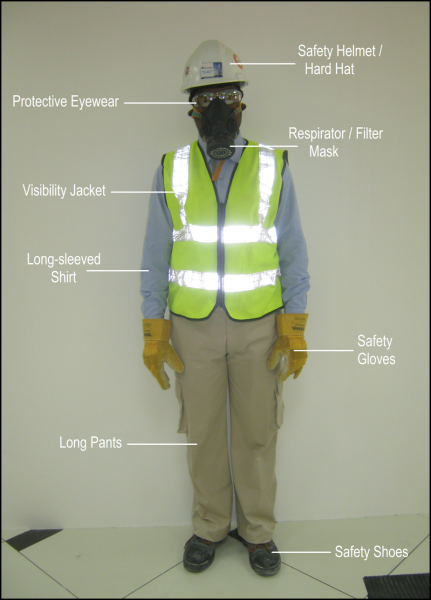 Respirators protect the applicator from inhaling toxic chemicals. The label will tell you if a respirator is required. Consider wearing one during any lengthy exposure with a high risk of pesticide inhalation. Always wear a respirator while mixing or filling highly toxic pesticides. 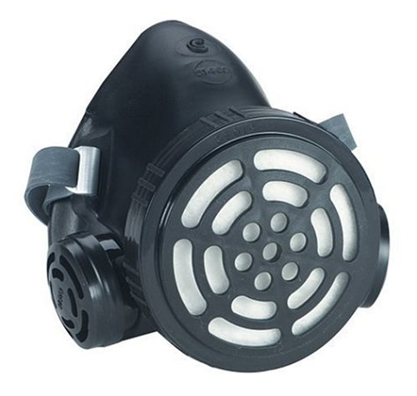 Applicators who will be constantly exposed to small amounts of moderately toxic pesticides for a day or several days, should also wear a respirator. 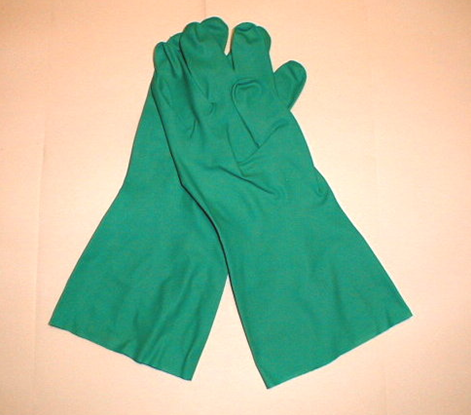 Always wear chemical-resistant gloves when handling all pesticides. Never use leather or cotton gloves as these types of gloves can be more hazardous than no protection at all because they absorb and hold the pesticide close to your skin for long periods of time. 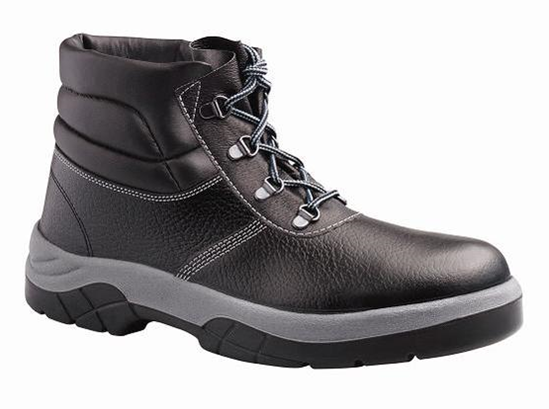 Always wear safety shoes when working in the site or when handling or applying moderately or highly toxic pesticides. Wash the shoes after each use and dry thoroughly inside and out to remove all pesticide residue. Use them only for pesticide applications. Regular work attire of long pants and a long-sleeved shirt, shoes, and socks should always be worn when applying pesticides. Many applicators prefer work uniforms and cotton coveralls that fit the regular-work-attire description and provide equal protection. Applicators should reserve one set of clothing for pesticide use only. Launder and store separately from all other clothing. All vehicles must be equipped with appropriate hazard and stop lights. 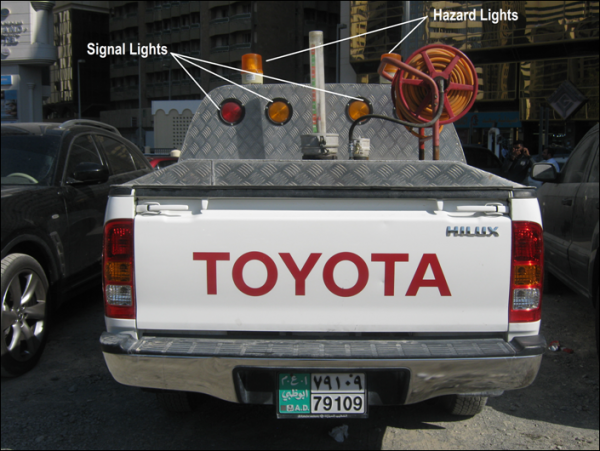 These warning lights should be used at all times while working inside the project site. 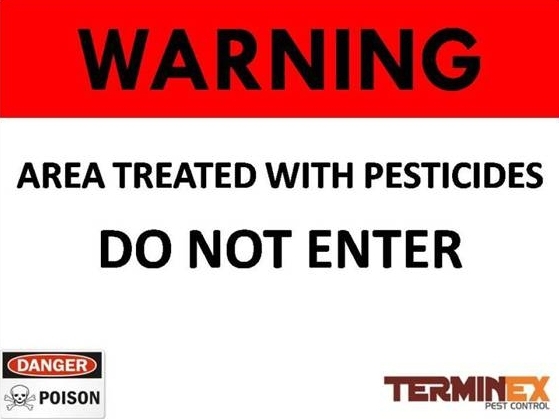 Prior to the start of chemical application, warning signs should be in place at the work site to notify all workers that anti-termite treatment application is in progress. 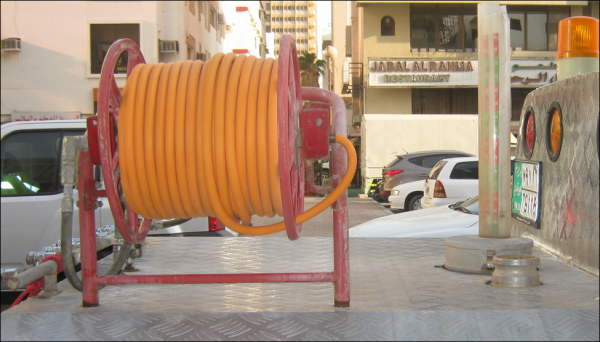 ECOPOISE Pest Control started operating in Abu Dhabi in 1999. In 2006, our company expanded its services to Dubai and has been one of the major players in the pest control industry in the South Africa since then.Our company is made up of professionals with extensive experience in the pest control industry. We also have certified entomologists who con-duct training for our technicians to ensure that our people can answer all your inquiries with confidence and accuracy. 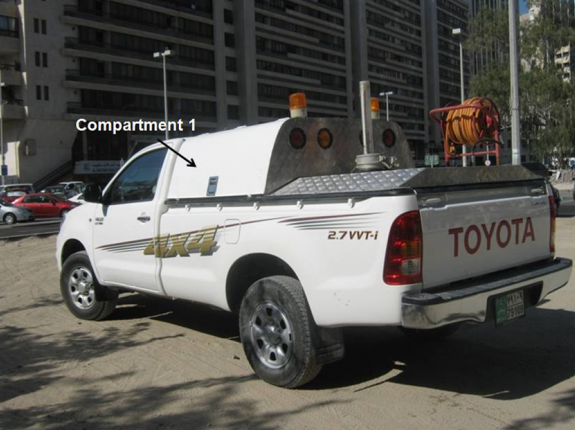 Lastly, we have the service technicians who make up the core of the company. Our existing customers can attest to the courteousness and dependability of our technicians when it comes to service treatments. ECOPOISE adopts international standards where our pest control services are concerned. As we all know, several studies have proven that the extensive use of chemicals is not only hazardous to the people and the environment, but also results in the development of insect resistance to pesticides. At ECOPOISE, we believe that modern pest control should be based on the foundation of scientific principles, technology, good judgement and sound decision. This is why our company relies on the principles of Integrated Pest Management (IPM). IPM is not a single pest control method but a combination of different control practices, ranging from cultural, mechanical, biological and chemical control. IPM is a program that combines information on pests and the available pest control methods, then use this to manage pest damage in the most economical means and with the least possible hazard to people, property and environment. You can trust that all our service programs are designed using the principles of IPM and that you and your family will only receive the most effective and safest way to pest management. We take pride in the ECOPOISE name and we support this by giving our commitment to provide you with quality service. Any building or facility is prone to termite damage, there are numerous ways to control termite infestation. It can start prior to building your home (Pre-construction Anti-Termite Control) and when your house/building is already built (Post-Construction). There are also varied choices for the materials you wish to use for the control, be it chemical (liquid or bait matrix) or physical barriers (wire mesh). Below are some more information for anti - termite control. Termites are soil or wood inhabiting insects which generally have soft, white bodies and highly practice random feeding. They are small in size (4-11 mm) and are sometimes called “white ants” due to some similarities. Mostly they could be found in damp and rotting wood. These insects are classified under the order Isoptera (iso = equal and pteron = wing), wherein they have equally-sized wings. Shedding of wings usually occurs after a short nuptial flight, which males and females pair up to start a new colony. All termites are cellulose eaters – meaning they consume fibers of various plant and trees. They are able to extract cellulose due to protozoa in their system that comes from the queen. These creatures are highly considered destructive by nature. What is a Termite Colony?" open="no"]Termites are social insects that live in a nest or colony. This colony is typically located underground, wherein often near a tree or stump. Each colony contains four forms or castes namely: workers, soldiers, secondary reproductives, and primary reproductives (queen and king). Each member of the colony performs a specific role as defined by their hierarchy. This job specialization is what makes termites so productive and destructive. The Castle Classification" open="no"]Worker termites lack eyes and wings. They are white to grayish-white with a round, yellow-brown head and about 1/4 to 3/8 inch long. Workers can comprise as much as 80% of a colony. Their main function is to maintain the nest and forage for cellulose-based foods that they provide to the rest of the colony. The foraging and feeding activities are the damage result to structural wood. Soldier termites: If the colony is disturbed, the very first termites that will be present are the soldiers. Termites belonging on this class are wingless and somehow resemble worker termites except for a very large yellowish-brown head with dark-colored mandibles (jaw). The sole purpose of the soldiers is to defend the colony at any cost against any invader such as ants. that they have large, rectangular, yellowish and brown heads with large mandibles (jaws). The sole purpose of the soldier is to defend the colony against enemies such as ants. Secondary Reproductive Termites: They are being produced in mature colonies. 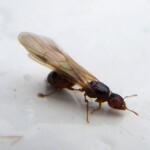 They are winged termites (commonly called "swarmers" or technically termed as "alates") that are usually brown-black to reddish-brown color and about 1/4 to 3/8 inch long. Their wings can extend up to twice their body size during maturity period. If the queen of the colony dies, one of the secondary reproductives will immediately take over. All of the matured reproductives leave the colony at the same time, habitually in spring or sometimes in fall. After landing on the ground, the initiative of each male is to find compatible mate to start a new colony. Swarmers have small percentage of surviving due to many factors. But once detected, this is considered a serious sign of infestation. Secondary reproductives are also commonly confused with winged ants. However, being mistaken by looking from a distance, they have several distinct visible differences between them. The representation below will give clarification on how to detect reproductive termite from a winged ant. Primary Reproductive (Queen and King): A typical termite colony will have a single pair of primary reproductives, which is the queen and king. 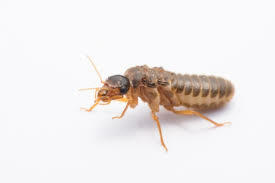 The main purpose of the Queen termite is to reproduce and to constantly supply "protozoa" needed by the workers to enable them to extract cellulose from wood. The King's responsibility on the other hand is to continuously mate with the queen for life. A mature Queen can lay thousands of eggs each day and some of the workers take care of these during their two-week incubation period. The approximate life span of a queen is known to be 15-25 years. Physical Termite Barriers – This approach is designed to protect the foundation of a structure and help homeowners detect termite activity without the use of liquid-based termiticide. These are typically made out of foam, stainless steel mesh, and other materials intended to prevent termites from having access to the property. Appropriate placement and installation of barriers can provide termite protection for houses with little to no risk of pesticide exposure to the people. This is a unique physical termite barrier using a simple concept of woven stainless mesh mainly to stop termites from entering homes through concealed entry points. The main objective of metal mesh installation is to completely close any gap between structures. This is considered by many to be the most effective of all termite barriers for new houses. a. The first area that needs this kind of protection is around plumbing pipes coming through the slab. The metal mesh is fixed to these pipes before the slab is poured and embedded into the concrete, sealing off the gap between pipe and concrete. b. The second is the outer cavity of the building. The metal mesh is installed in this area by fixing on the concrete slab. This unique approach use weave of fibrous blanket to prevent entry of termites. The polymer sheet contains crystals of highly potent termite control agent that repels termites, driving them away from the property. This approach is intended to intercept foraging termites feed them with bait matrix that has a slow-killing mode of action. Termites will eventually pass this bait to other members of the colony. The transfer of the bait matrix is extremely effective because worker termites that forage food must feed the rest of the colony member, including the queen. a. Monitoring bait stations will be installed around the perimeter of the establishment, each is equipped with wooden interceptors. b. Initial inspection must be done frequently to carefully observe possible termite occurrence. c. Once termites are detected, the bait matrix (in a form of dough-like) will then be added to the bait station where infestation occurs. The bait matrix will slowly act on the termite's system by inhibiting the ability to synthesize the production of "chitin". In this way, termites will not be able to molt which will result to suffocation and dehydration. The Bait matrix can easily be transferred to other members, which will lead to colony elimination. Remove all unnecessary materials and level the soil to be treated. 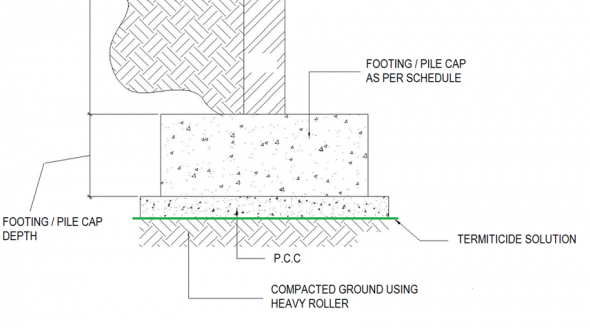 A termiticide solution will be sprayed prior to the PCC footing or pile cap foundation. The dilution and application rates per square meter will be based on manufacturer’s recommendation. Provision of polyethylene sheet is recommended to extend period of casting up to 36 hours. Backfill the sides up to the top level of the footing/pile cap. 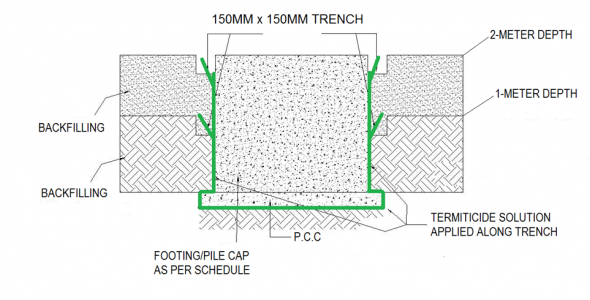 Make a trench with 150mm width x 150mm depth along the perimeter of the footing/pile cap. 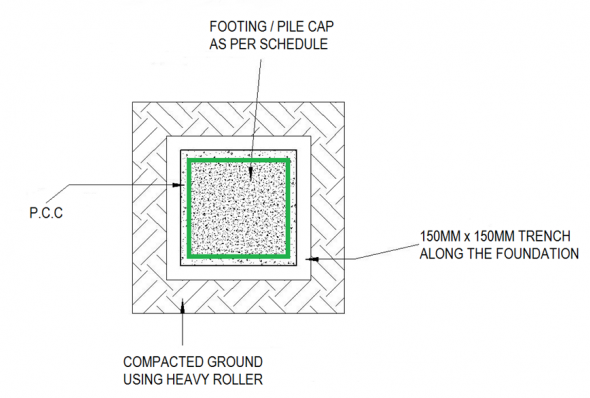 A termiticide solution will be applied into the trench along the perimeter of the footing/pile cap. The dilution and application rates per linear meter will be based on manufacturer’s recommendation. Backfill the trench within 36 hours of treatment. For footing/pile caps deeper than 1 meter, repeat steps 1 to 4 until the proposed foundation is totally backfilled. Backfill the sides of the retaining wall up to 1 meter deep. 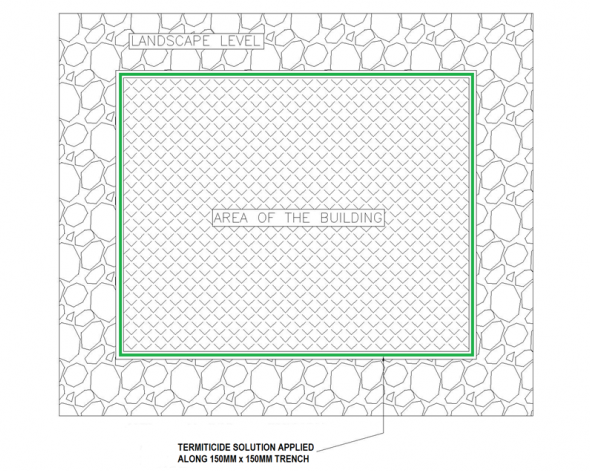 Make a trench with 150mm width x 150mm depth along the sides of the retaining wall. A termiticide solution will be applied into the trench along the perimeter of the retaining wall. The dilution and application rates per linear meter will be based on manufacturer’s recommendation. Repeat steps 1 to 4 until the required level of backfilling is achieved. 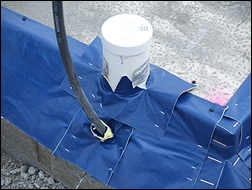 A termiticide solution will be sprayed prior to the PCC of tie beams. The dilution and application rates per square meter will be based on manufacturer’s recommendation. 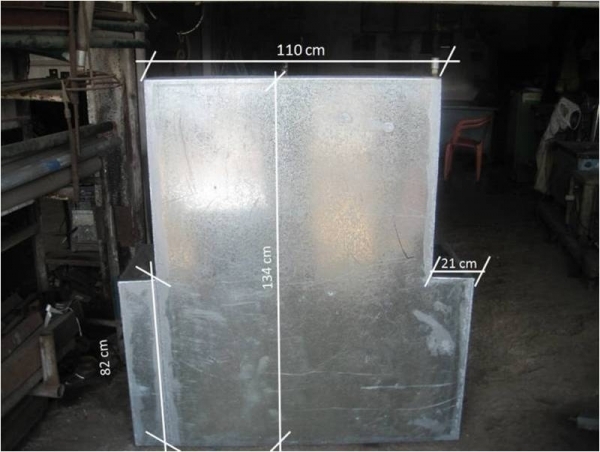 Provision of polyethylene sheet is recommended to extend period of casting up to 36 hours. 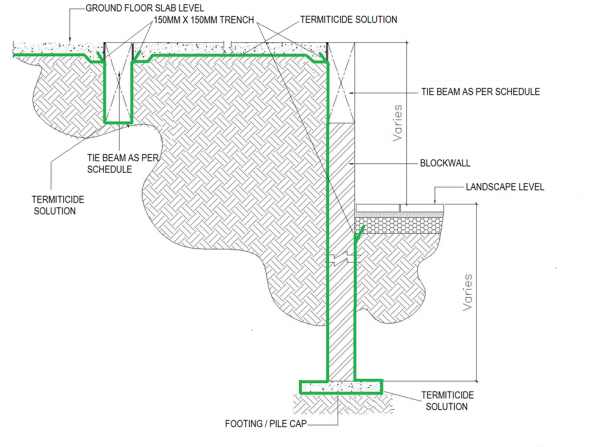 Make a trench measuring 150mm width x 150mm depth along the perimeter of the tie beams. A solution of the termiticide will be sprayed prior to the casting of the ground slab. The same solution will be applied along the perimeter of the tie beams. 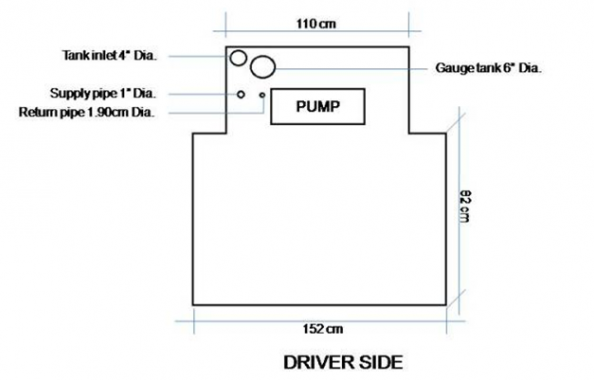 The dilution and application rates per square / linear meter will be based on manufacturer’s recommendation. 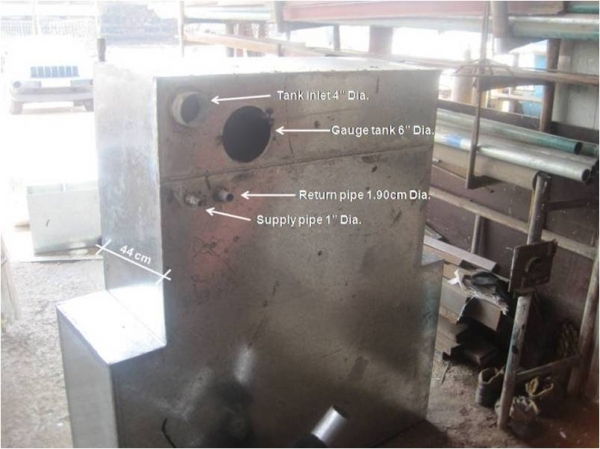 Provision of polyethylene sheet is recommended to extend period of casting up to 36 hours. 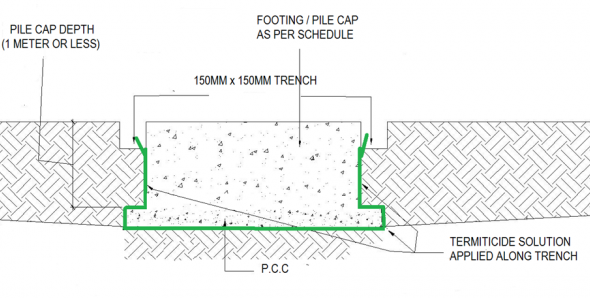 Make a trench, 150mm in width and 150mm in depth, along the external perimeter of the building at the same level of the landscape. 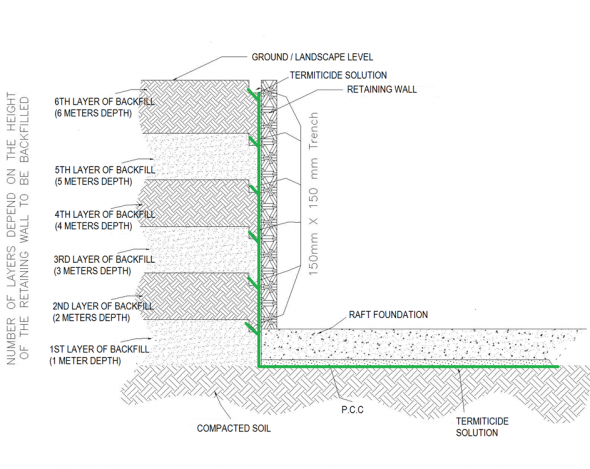 A termiticide solution will be sprayed into the trench along the external perimeter of the building. The dilution and application rates per linear meter will be based on manufacturer’s recommendation. Backfill the trench within 36 hours after the treatment. Pesticides can be categorized into the following: Organophosphates, Organochlorines, Carbamates, Pyrethroids and Green Pesticides. Organochlorines are organic compound containing at least one covalently bonded chlorine atom. Their wide structural variety and divergent chemical properties lead to a broad range of applications. Many pesticides contain chlorine. However, many of its derivatives are controversial and some have been banned in various countries because of the adverse effects of these compounds on the environment. Some of the notable examples include DDT, dicofol, heptachlor, endosulfan, chlordane,aldrin, dieldrin, endrin, mirex, and pentachlorophenol. Organophosphates - refers to a group of insecticide or nerve agents acting on the enzymeacetylcholinesterase. Organophosphate pesticides irreversibly inactivate acetylcholinesterase, which is essential to nerve function in insects, humans, and many other animals. Commonly used organophosphates have included parathion, methyl parathion,chlorpyrifos, diazinon, dichlorvos, phosmet, tetrachlorvinphos, and azinphos methyl. An example of Organophosphate termiticide available in the South Africa is Contra Insect 480 TEC which contains the active ingredient Chlorpyrifos. Carbamates - are organic compounds derived from carbamic acid (NH2COOH). A carbamate group, carbamate ester, and carbamic acids are functional groups that are inter-related structurally and often are interconverted chemically. Carbamate esters are also called urethanes. Carbamate insecticides kill insects by reversibly inactivating the enzymeacetylcholinesterase. The organophosphate pesticides also inhibit this enzyme, although irreversibly, and cause a more severe form of cholinergic poisoning. Some examples of insecticides from this group are aldicarb, carbofuran, Furadan,fenoxycarb, carbaryl (Sevin), ethienocarb, and fenobucarb. Pyrethroids – are synthetic chemical compounds similar to the natural chemical pyrethrinsproduced by the flowers of pyrethrums (Chrysanthemum cinerariaefolium and C. coccineum). Pyrethroids now constitute a major proportion of the synthetic insecticide market and are common in commercial products such as household insecticides. 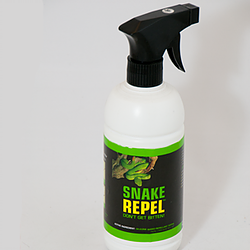 In the concentrations used in such products, they may also have insect repellent properties and are generally harmless to human beings in low doses but can harm sensitive individuals. They are usually broken apart bysunlight and the atmosphere in one or two days, and do not significantly affect groundwaterquality. Some examples of pyrethroids are Allethrin, Bifenthrin, Cypermethrin, Cyfluthrin, Fenvalerate and Permethrin. Green pesticides - are pesticides derived from organic sources which are consideredenvironmentally friendly and causing less harm to human and animal health, and tohabitats and the ecosystem. These pesticides are also called ecological pesticides. In agroecology, pesticides are evaluated for minimal adverse environmental effects.Biocides include germicides, antibiotics, antibacterials, antivirals, antifungals, antiprotozoals and antiparasites. Pesticides typically come in the form of sprays anddusts. Many ecological pesticides are biological pesticides, but others are minerals or chemical compounds. 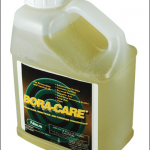 An example of a green pesticide available in the South Africa is Bora-Care which contains a borate mineral salt as its active ingredient. Contra Insect 480 TEC is used for the control of subterranean termites in soils, either pre or post construction treatment and is effective for buildings with slabs, basement and crawl spaces. The active ingredient Chlorpyrifos, belongs to the chemical group Organophosphate and has a strong contact, stomach and respiratory effect. 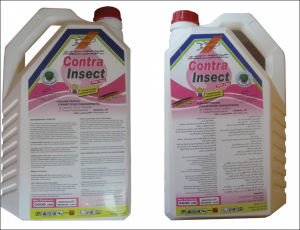 Contra Insect 480 TEC’s residual efficacy comes from its ability to bind with soil particles for many years. 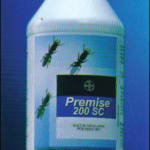 Premise SC 200 is an innovative termiticide from Bayer used by more and more Pest Control Operators (PCO). The active ingredient, Imidacloprid, belongs to a new class of chemicals called Chloronicotinyls. Termites will enter the non-repellent Premise - treated zone for a few centimeters but are rapidly affected by the active ingredient. They become dysfunctional, stop feeding and are no longer able to coordinate their tunneling through the soil. Bora-Care is formulated with a concern for the environment. It contains the active ingredientDisodium Octaborate Tetrahydrate which is a borate mineral salt. Borate salts work by taking advantage of a unique feature in the biology of termites, ants and other insects. If ingested by termite, ants or beetles, the insect becomes unable to extract nutrition from its food and starves to death. Bora-Care has also been given an Environmental Award and Overall Grand Prize winner at the National Green Building Conference by the Green Builder Magazine. Removing access to nesting sites (for instance by putting barriers over window ledges) can be an effective bird deterrent. Keep any possible food sources well hidden. Make sure bin lids are secure and rubbish bags are not left in the open – gulls, especially, have sharp beaks that will make short work of bin bags. Pigeons and seagulls can become a real nuisance for your business. It’s not just the mess they make; they can also damage your premises by dislodging roof tiles and blocking guttering. Our avian specialists are experienced in how to get rid of pest birds at your place of work, whatever the location. Using discreet, cost-effective methods of pest bird removal like bird proofing or netting, we can get rid of your pigeon or gull problem without harming the birds.